Kelsey Gertje completed a Bachelor of Arts in Music Education at Central Washington University. She has been teaching trumpet, trombone and euphonium lessons at Music and Arts since November 2017. 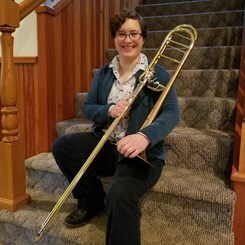 She plays the trombone, and serves as a guest teacher in the North Thurston Public Schools. Kelsey strives to empower her students with strong practice skills and learning techniques. She enjoys helping them play to their strengths while encouraging them to develop new skills. Request Lessons with Kelsey today!